Here, a pair of Sheaffer's snorkel fillers from the mid 1950s. The snorkel filler, launched in 1952, was one of the last salvos in the great fountain pen technology wars that ended when the industry noticed that everyone was buying ballpoints anyway. The top pen is from the senior line, and carries the corresponding white dot and two-tone Triumph nib, while the lower makes do with a conventional open nib and a narrower cap band. Otherwise, both pens are in a festive scarlet, made from an injection-molded plastic called Fortical that Sheaffer began using in the late '40s. The injection molding process eliminated much of the hand work required to manufacture these pens, but unfortunately also spelled the end of the attractive marbled and laminated celluloid finishes. The Sheaffer Snorkel Nib (above) looks like something that the Bulgarian secret police might have issued back in its glory days!!! Illustrated below are all the principal parts of a Sheaffer snorkel; this is a fairly complex pen by anyone's standards, which perhaps explains why the cartridge/converter option began to look so appealing to Sheaffer and other penmakers. Although you might think trying to shoehorn the plunger tube, a helical ribbon spring, and the snorkel itself into the slender bodies of these "TM" (thin model) pens would leave very little room for the actual ink, this actually isn't the case, and the pen's design doles out the ink very efficiently between fills. 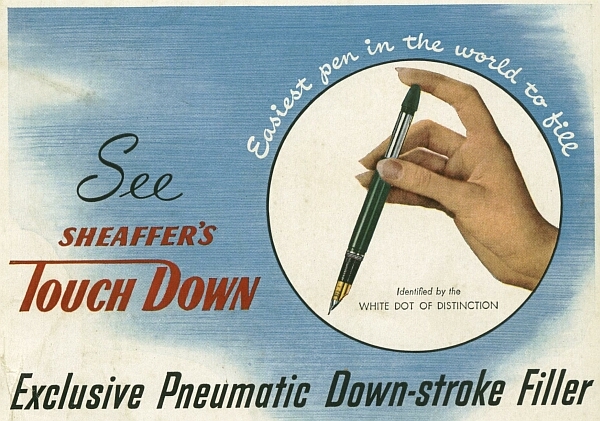 According to Frank Dubiel's book, the Sheaffer snorkel will write more words per fill than nearly any other fountain pen, despite the small size of its sac. The secret, as with the Parker 51 (another long write-out) is in the airtight seal of the ink supply. 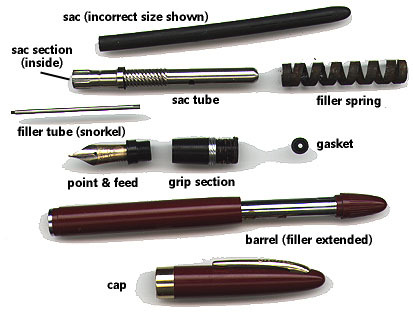 To fill a snorkel pen, you unscrew the blind cap, which forces the sac tube upward into the section, extending the filler tube. Dip the filler tube into the ink. Pull out on the blind cap, then push it back in once, smartly. This creates a surge of high air pressure within the pen (audible as a "burp" sound) which, acting through the holes in the sac tube, deflates the sac. Leave the pen in the ink for thirty seconds or so, and the sac will draw in a load of ink. Screw the blind cap home to retract the snorkel and you are ready to go. In good repair, the Snorkel is an effective weapon; it will squirt ink at a range of several feet!!! The first Touchdowns were large, thick pens with correspondingly large two-tone nibs. After only one year, however, the line was slenderized; the redesigned pens were termed "TM", for "Thin Model". Although successful, this line was itself in production for only a few years – although the most economical models remained in the lineup for much longer.